I’m wanting to try a sprouted wheat sourdough bread, but after reading a bit I’m thinking the sprouted wheat flour I have is not a high gluten one (it’s King Arthur brand). It’s a white wheat with a 13.5% protein content. Am I understanding that correctly or will it still work? 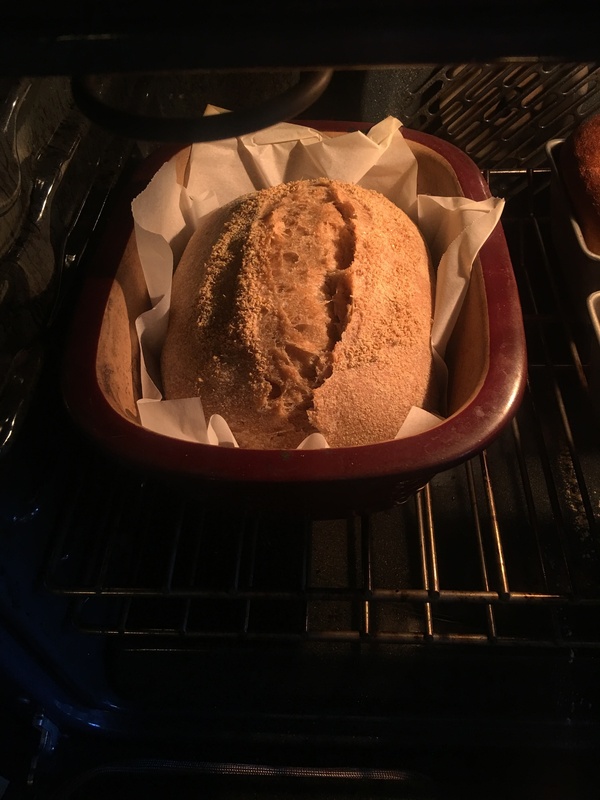 I’ve been baking bread since I was 8 or 9 years old but it wasn’t until a year ago that I discovered things like “baker’s percentages”, and “cloches, lames, and bannetons”, and weighing your ingredients??!!! It’s been a fun learning curve, but I’m still fairly low on the curve! I think I have a fairly good grasp of white sourdough baking now, so whole grain sourdough is my newest challenge. Hi-just a quick post to comment that this worked really well for me. I was worried my final proofing wasn’t working - dough was very wet and not much rise in the basket, but when I tipped it onto the paper it seemed very poofy, so I went ahead and put it my casserole. I loved that when I removed the lid 30 mins later, I saw lots of spring! I haven’t sliced it yet but high hopes. I used a combo of red spring and hard white winter wheat berries, milled in my nutrimill along with my pineapple starter from Peter Reinhart. Super happy so far! Am I misunderstanding something? 15 minutes at room temperature is not within the range 1-1.75 hours at room temperature. Proofing time and temperature is inherently complex, because there are infinite ways to approach the bulk fermentation and the final proof. In between those hot and cold extremes, you have infinite possibilities. 15 minutes in that hot kitchen, followed by 4 hours in the refrigerator being one example. These are just examples, and bakers need to look and and touch their dough too, as well as get more and more experience. Something to be aware of is that when you put dough in the fridge, the temp and fermentation stays high for a while as it cools down. Once the dough is down to 38 F, changes don’t happen fast, so the difference between proofing of 12 vs 16 hours is minimal. The difference between warm proofing 60 minutes vs 80 minutes is bigger. Thanks, Melissa – I’ll be attempting this project in the near future! No, brec, you weren’t misunderstanding; you were misreading. That’s “15 minutes at room temperature and 12 hours in the refrigerator [emphasis added],” not 15 minutes at room temperature or 12 hours in the refrigerator. Thanks again, Melissa, for your patient and informative reply. You’re welcome and no worries! UPS promises that tomorrow they’re bringing me a Mockmill 100 and a free bag of Heirloom Turkey Red wheat berries. Mockmilling and Turkey Red were (separately) elements in your first experiments, and didn’t make the finals. But I’d really like to substitute 550g of Mockmilled Turkey Red for the two Breadtopia flours in your final recipe. Are there any adjustments you’d make for that substitution? Separately… any tips on estimating 50% growth of dough in a bowl? I’m not sure I could distinguish 50% from 30% or from 70%. (So far, I haven’t found any straight-sided transparent containers of reasonable diameter as solutions to this problem.) More generally, one of my big issues as a new breadmaker is making the judgment calls as to when bulk and final proofing are done. Congrats on your soon-to-arrive Mockmill! I love it. I use it for 50% chickpea pasta, whole grain pie crust,cookies,cakes…and bread, of course. You can separate a small piece of dough from your main dough and put it in a container with straight walls and measuring marks (Sharpie on the outside) or simply a rubber band. The vigor with which somebody stretches and folds their dough impacts the dough’s expansion. So a dough can be pretty far along, but it won’t look as big if you do late or de-gassy stretching and folding vs. if you left it alone. Despite this confusing/misleading aspect to the process, most bakers don’t use the side cup of dough because they start to feel and hear the finished dough, as well as see it. I do keep an eye on expansion in the bowl and bubbles thru the base of the bowl, but I also have some of that touch and sounds “sense” of how much longer to go when I stretch it. Or I simply end the bulk because I have a time constraint, so I try to prolong the next stage (final proofing). Such is life and there is some wiggle room. In the beginning, you’re probably better off overbulking and underproofing - if you’re gonna err on one side. I hope you have a great time baking! I hope to hear how it goes! UPS has narrowed it down to 2-4 hours from now. Can you define or describe the adjective “proofy” that you used in the recipe as a possible characteristic detected during pre-shape? I assume it’s different from “puffy” that denotes one of the criteria for completeness of bulk fermentation. Proofy to me is when a dough is webby but slack, and has popped blisters/bubbles. 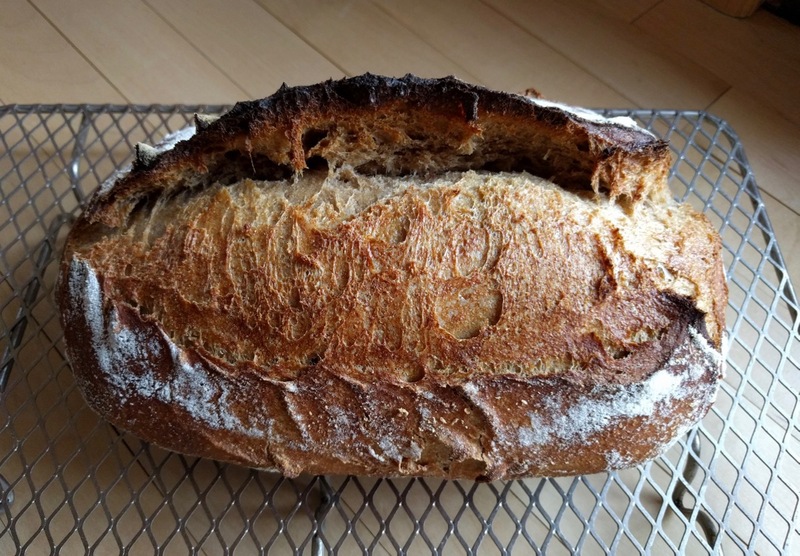 If you look at the photo gallery in this recipe, the bulk fermentations of the three versions were on the long side, in my opinion, making for proofy dough. It looks different depending on the amount of whole grain flour. And the gluten developing abilities of the wheat variety you use. Kamut wheat is renowned for its delicious buttery, nutty flavor, and high nutritional value. It has a unique golden hue, and when combined with conventional wheat bread flour, it makes a pale, open, and airy crumb. I looked for something suggesting a lattice, but didn’t see that in the photos. The three – 100%, 40%, 20% – really differ a lot. M’self, I’m sticking with 100% to make my life difficult in the kitchen but healthier overall. In case it strikes your fancy – a glossary of words bakers use among themselves to describe dough states, such as “proofy” and “webby” – would be useful for us newbies. One of your conclusions was that high wheat protein content contributed to open crumb. I notice in the chart* that the ancient grains – einkorn, spelt, kamut (and maybe emmer, but no data) are protein champs. I have no experience with those grains (nor with most anything else ), but I wonder if you think it would be useful to use them as primary flour components of a WW sourdough. Do these grains have downsides that offset the higher protein? Although gluten is a protein, it isn’t the only protein in wheat flour and “protein content” does not necessarily equate to gluten content. Of the grains you listed above, in my experience, spelt is the most likely to give you a relatively open crumb, though less so than hard red, turkey, red, or red fife. Einkorn and emmer both have relatively low gluten content and it’s pretty hard to get much of a rise or an open crumb with either of them. Kamut is in the middle - less open than spelt, more open than einkorn and emmer. As to the ancient grains, for now I’ll not go back farther than a couple of centuries. I tried the sort-of recipe and got an unsuccessful result—or to put it more positively, a great opportunity to learn. I hope someone can suggest what my results indicate about how I can approach the process differently. First, I did not understand what “three rounds of stretching and folding” means. 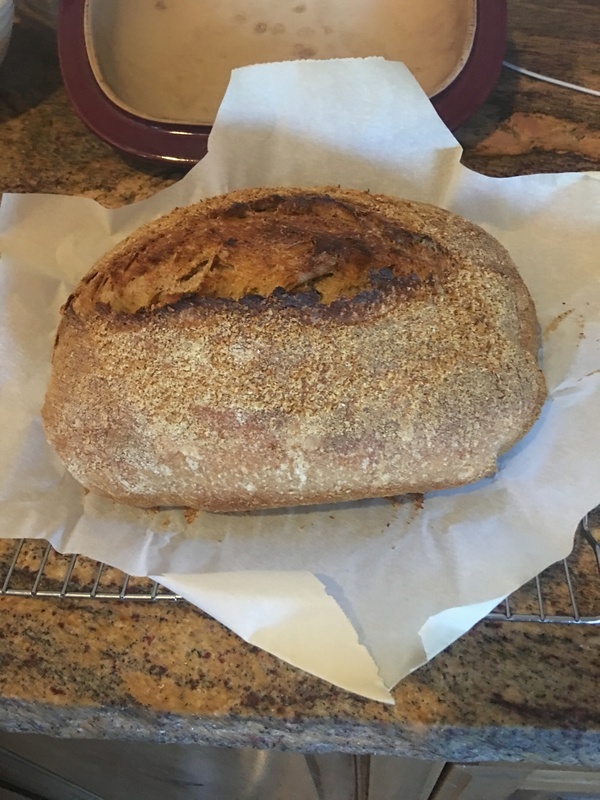 Before I tried this loaf, I baked a whole-grain loaf at Zero Waste Chef (https://zerowastechef.com/2015/09/17/sourdough-bread/). The procedure outlined there includes stretching the dough in the bowl, folding it over, turning the bowl a quarter turn, stretching and folding again, and repeating for four times total. So I considered that to be a round of stretching and folding. Is that okay? Second, after retarding the dough for eleven hours, I noticed only a little expansion. I suppose now that was a sign that I shouldn’t have gone forward with the process, but I did anyway. I proofed the dough for 1.75 hours at room temperature. After baking, the dough seemed flat. After a few hours, I cut the loaf. The inside had some largish holes, but the bread was gummy (though still edible). Does the gumminess suggest that my loaf was underproofed? Maybe I should have left the dough out at room temperature for a bit before retarding it. If I didn’t do the stretching, folding, and shaping properly, could that account for the gumminess? In case it matters, I should say that I used a whole-grain starter. When terms like “rounds of stretching and folding” are used, could a link be inserted that explains what that means? It sounds like your dough was underproofed. Going by dough feel and expansion is always preferable to looking at the clock because of the many variables that influence fermentation speed. Your interpretation of the instructions for rounds of stretching and folding was correct There are quite a few strategies for stretching and folding, and in my opinion it’s mostly about personal preference and dough feel. A newfangled approach – “laminating” during the bulk fermentation. Lamination usually refers to croissants and layers of dough and butter, but now it’s also a type of stretching and folding. Thank you for the pointers on stretching and folding. I am in the middle of trying the bread again. Last night, I mixed the flour, water, starter, and salt and used the Rubaud method, though for much longer than 2.5 minutes because I couldn’t get the same speed as in the video. Then I stretched and folded, but for eight stretch-and-folds per round rather than four, to more closely match what the videos showed. Next, I left the dough out for an hour before retarding; I thought that would cause the dough to rise, as it didn’t for my first attempt when I retarded it right away. But after eleven hours in the refrigerator, the dough didn’t seem to rise one iota. So I left it out at room temperature for six hours. Still, it didn’t rise. A few minutes ago, I put it on the wet cutting board under a bowl, thinking that maybe I didn’t notice that it rose. The dough seemed very loose; I had to work to get it to fit under the bowl because it kept wanting to spread out. I’m inclined to just toss the dough, but I might try proofing it at room temperature. I doubt that will do any good. My starter doesn’t quite double in size between feedings, but it seems active, and it deflates when I stir in the new four and water. But could it be subpar? A couple times over the last week, I missed a feeding, but still I notice bubbles. I fed it on time for the past few days. Do you have an idea what I’m doing wrong? I intended to toss the dough from yesterday but I left it because I went out. This morning when I checked it, I discovered the dough had risen. So I decided to bake to see what would happen. The dough was very loose, so I had to scrape it into the parchment paper lining my Dutch oven. The looseness did not lend itself to scoring with a razor blade. After baking and letting the bread rest four hours, I cut it open to discover that the crumb was fairly open though gummy (but less gummy than my first attempt). The bread tasted sour for sure. The top of the loaf cracked open despite my feeble attempts to score it. In total, the dough set one hour at room temperature, eleven hours in the refrigerator, and twenty-two more hours at room temperature. Does the long delay in rising signal that my starter wasn’t quite ready? How important is it to use the exact brand of flour listed? I had King Arthur organic red spring whole wheat flour and organic white whole wheat flour, so I used that. 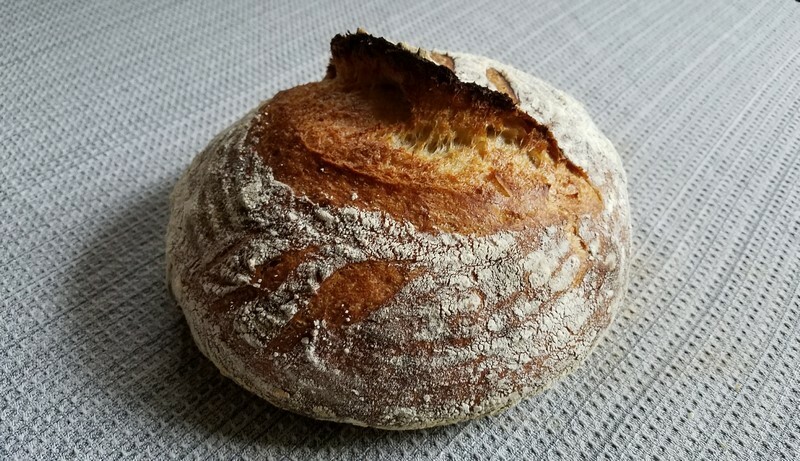 Would using the Breadtopia flour have resulted in a better outcome? I’m so glad you didn’t throw away the dough. Your flour substitutions should have been fine - not an issue.